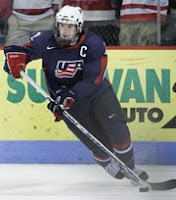 Two-time All-American defenseman Matt Gilroy is one of only two college players invited to the U.S. Men's National Team training camp in Portland, which began today and runs through April 30. Gilroy, who will co-captain the 2008-09 Terriers, will participate in an exhibition game against Sweden on Sunday. All three coaches of the U.S. Men's National Team, which will compete at the 2008 IIHF World Championship in Quebec City, Quebec, and Halifax, Nova Scotia, May 2-18, are former college players. Former BU captain and current Tampa Bay assistant Mike Sullivan joins Lightning head coach John Tortorella, a former Maine Black Bear. The assistant is ex-Providence Friar Kurt Kleinendorst, who is head coach of the Lowell Devils. NHL Central Scouting has issued its final rankings for the 2008 draft. BU freshman forward Colin Wilson was ranked #10 among North American skaters. Four Terrier recruits also were ranked: Corey Trivino, #49, David Warsofsky (photo), #81, Max Nicastro, a 2009 recruit, #90, and Vinny Saponari ,#122. Wilson and Trivino have been invited to attend the NHL Central Scouting Draft Combine May 26 to June 1 in Toronto. Trivino, Saponari and Warsofsky all were medal winners at the IIHF World U18 Championships. Trivino and his Canadian teammates earned the gold with an 8-0 blitz of Russia. Trivino scored his fourth goal of the tournament in the championship game to finish with 4-3-7, 5th best for Canada. Warsofsky's seven assists for bronze-medal winning USA was tied for most points by a defenseman in the tournament. Saponari added two assists. Chicago Steel defenseman Nicastro and Omaha Lancer forward Chris Connolly, a 2008 recruit, are in the semifinals of the USHL Clark Cup playoffs. Omaha is matched up with Lincoln and Connolly is currently second among all playoff scorers with six points. The Steel, the surprising victors over Indiana now taking on Waterloo, are led by USHL Coach of the Year Steve Poapst, a former NHL defenseman. He recently commented to Paul Shaheen's Research on Ice about the progress first-year defenseman Nicastro: "Max is doing well. He's learning to be more patient and control his movement away from the puck." Max Nicastro actually moved up from #117 in January to #90 in the final rankings. Thanks for catching those errors which now have been corrected. He shoots, he hits, he blogs!